There was a spike in the number of shark encounters and shark attacks around the island of Maui in the State of Hawaii during 2012 and 2013. 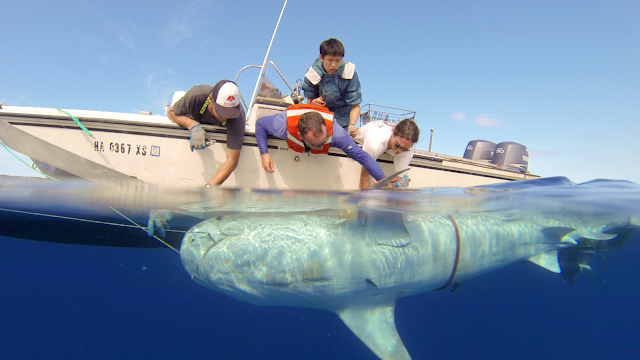 In an effort to understand tiger shark movements around the islands, researchers from the Hawaiʻi Institute of Marine Biology tagged 41 tiger sharks with satellite and/or acoustic tags off Maui and Oahu. They tracked their movements for up to two years and reported their findings to the scientific community and general public. 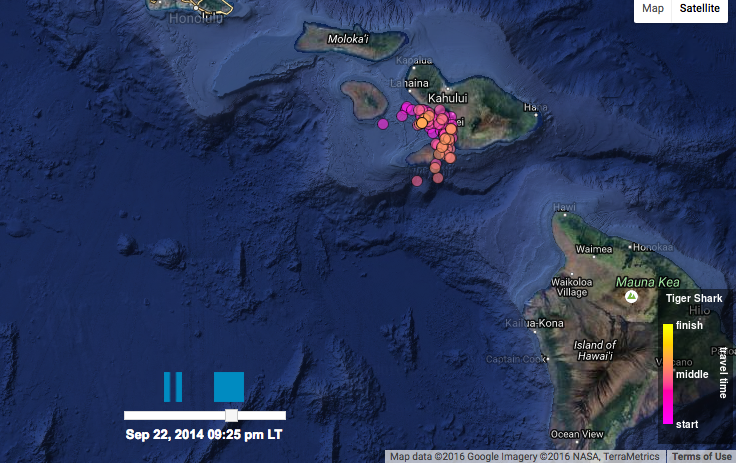 The Hawaiʻi Tiger Shark Tracking is an online tracking system that provides a colorful online map that shows the most recent detection of each tagged tiger shark [see here]. Visitors can select a specific shark from the database and see an animated archived tracking of the movement for that particular shark. The sharks are listed by size (e.g., 4.1 meters), gender, and its positioning throughout specific time periods. The tags were attached to the shark’s dorsal fin and sent a signal to the database every time the shark's fin broke the surface of the ocean. While there is a degree of uncertainty - over a mile in error associated with any given point - the tracking is fascinating. 1. Tiger sharks prefer to spend time on insular shelf habitat, the gently-sloping area between the shoreline and the shelf break at a depth of around 600 feet. This type of shelf habitat is home to a wide variety of natural shark food. 2. Despite the routine presence of large tiger sharks close to popular beaches, tiger sharks normally avoid interactions with people. 3. The natural presence of large sharks in Hawaii coastal waters is expected and inevitable. Photos courtesy of the Shark Research Team of the Hawaiʻi Institute of Marine Biology of the School of Ocean and Earth Science and Technology (SOEST) at the University of Hawaiʻi at Mānoa.